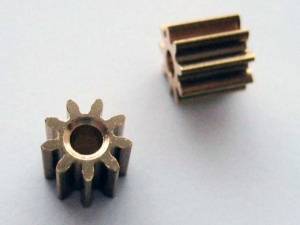 9T 1.5mm Brass pinions (2-pack) now available. Fits C05M brushless motor w/1.5mm shaft used for mCP X brushless conversion. Free shipping via USPS. Price includes delivery confirmation (tracking) for domestic orders. Please allow 1 week for delivery in the United States, and 2-4 weeks outside the US. International shipping is included in the same price, however the custom form number (it is NOT an official tracking number) only tracks the package as far as New York or Los Angeles. This entry was posted in Blade mCP X, Shopping. Bookmark the permalink.